Lt. Gov. 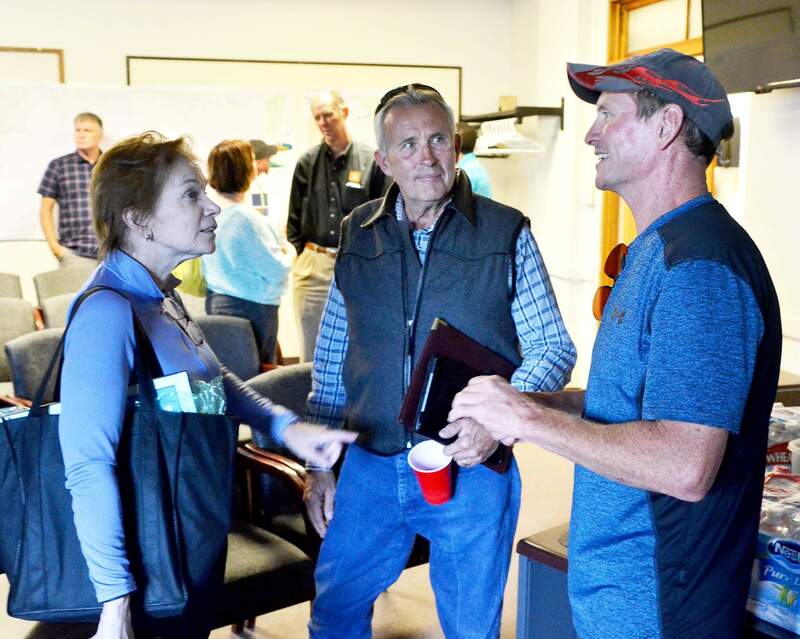 Donna Lynne chats with Montezuma County commissioners Keenan Ertel and Larry Don Suckla after a meeting last week about proposed trails for Montezuma County. 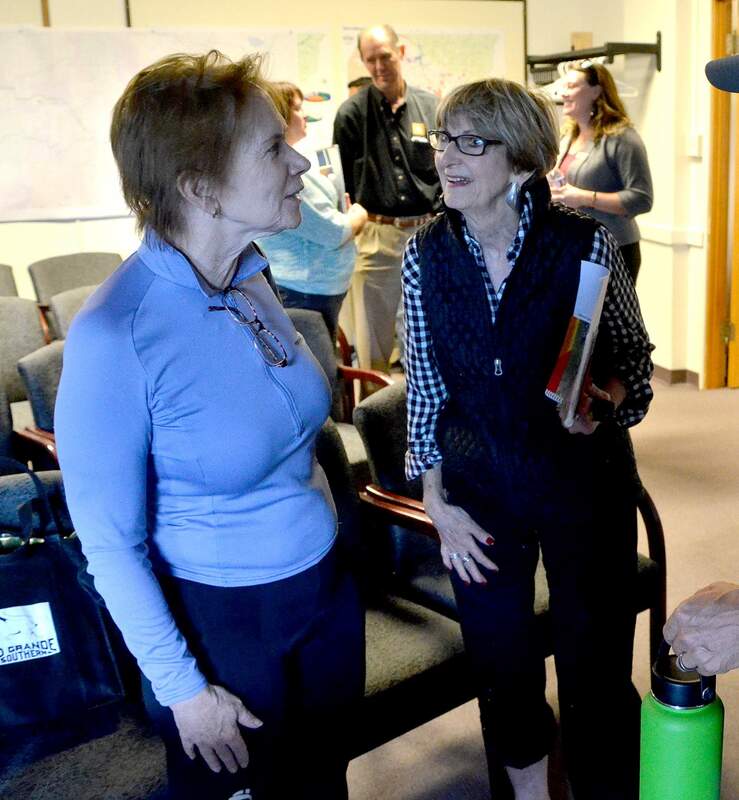 Last week, Montezuma County commissioners heard a proposal for a 20-mile nonmotorized trail that would connect Cortez and Mancos with Mesa Verde National Park. Engineering firm Loris and Associates has presented its preliminary analysis of the proposed Paths to Mesa Verde trail to the Montezuma County commissioners and stakeholders. “We’re looking at possibilities within a 4-mile wide band along Highway 160 between Cortez and Mancos,” Loris told commissioners last week. The county said that besides the main trail, spurs to the county fairgrounds, Phil’s World trail system, Southwest Colorado Community College, a U.S. Highway 160 rest stop, and the national park are also a priority. Environmental reviewsA lot of work lies ahead for the ambitious plan, officials said, and phased construction would not start before 2018. Once a route is agreed upon, the real work begins, including detailed surveys, construction plans, fundraising and negotiating easements across private land, federal land, and Colorado Department of Transportation rights of way. Mesa Verde National Park Superintendent Cliff Spencer added that the new trail is included in a visitor distribution plan being formulated at Mesa Verde that includes new trails and shuttle services to trailheads. A $400,000 planing grant, awarded for the project in 2014 from federal transportation funds, is being administered through CDOT. AdministrationCDOT and the county are taking the lead on the trail, and it would be maintained by the county, likely in partnership with other stakeholders. Because it is a designated state transportation trail connecting communities, it is required to be plowed in winter for year-round access. “Look ahead, and ‘ride like you did as a kid,’ were good tips,” Lt. Gov. 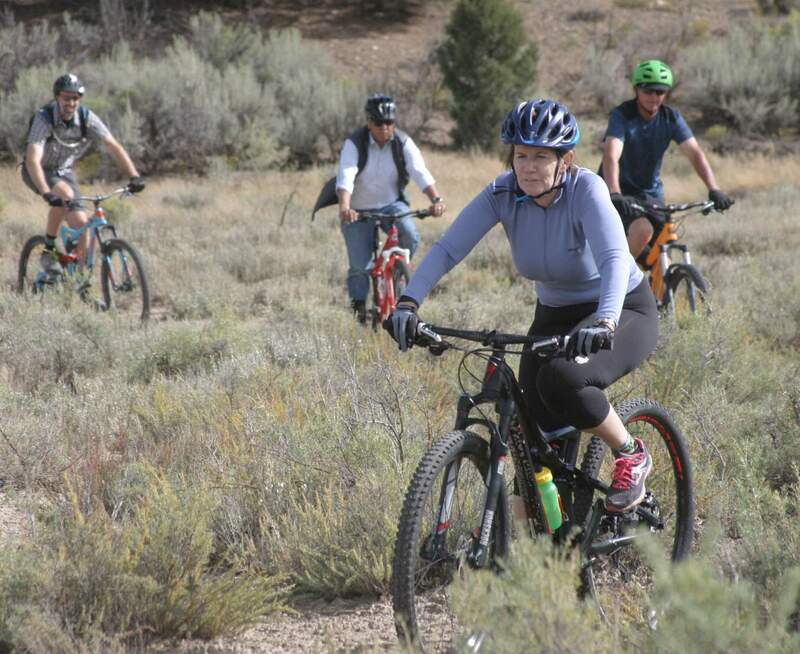 Donna Lynne said during a mountain bike tour of Phil’s World with local dignitaries Thursday. Along with Gregory, Lynne was joined on the ride by Montezuma County Commissioner Larry Don Suckla, Cortez City Manager Shane Hale, Executive Director for Colorado Commissioner Affairs Ernest House, BLM staffer Jennifer Jardine, Colorado the Beautiful Project Manager Chris Kehmeier and a reporter with The Journal. 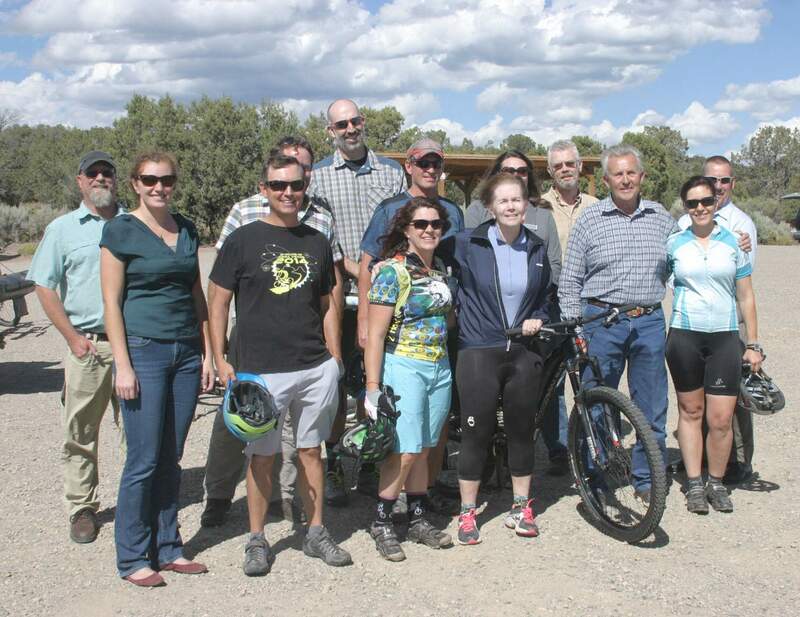 The tour was part of a promotional event and strategy session for the planned Paths of Mesa Verde, a 20-mile nonmotorized trail that would connect Cortez and Mancos with Mesa Verde National Park. “We are so pleased to have you experience first hand the great trails we have to offer,” said Montezuma County commissioner Larry Don Suckla.